Having explored a section of ancient Istanbul’s sea walls we thought it would be interesting to take a look at the city’s land defences. Running for approximately 6.5km from the Sea of Marmara to the Golden Horn, the Byzantine land walls complete the defences which made Constantinople, as it then was, such a secure place, invulnerable to invasion for centuries. 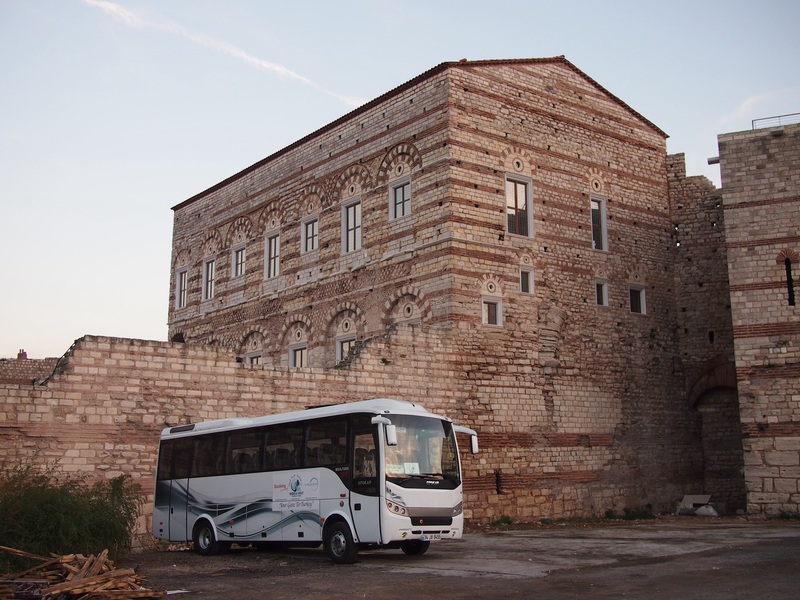 They were initially built in AD413 but an intense earthquake in 447 caused considerable damage and, as Atilla the Hun was advancing on the city, the repairs needed to be speedy. 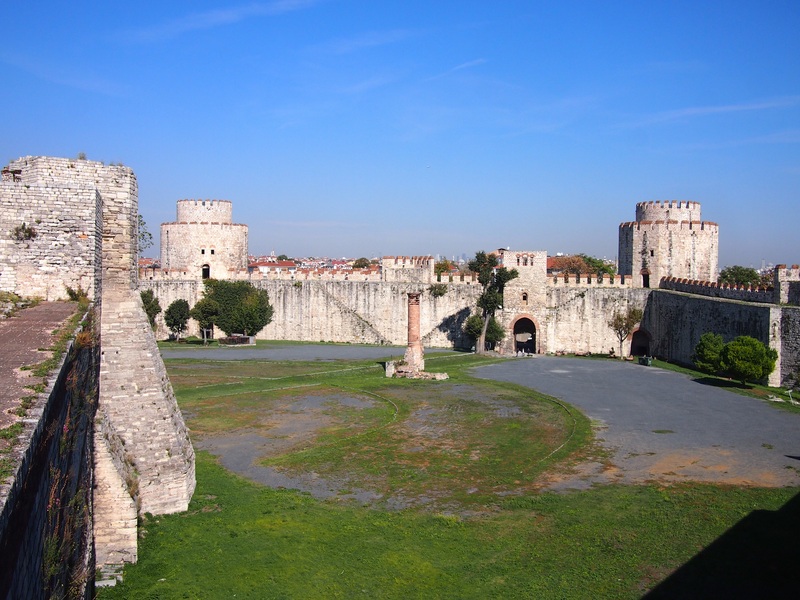 Constantine, the Prefect at that time, threw all of the city’s resources at the task and managed to complete the job in just two months with improvements in the form of an outer wall and moat. Impressive indeed and successful in holding back Atilla. 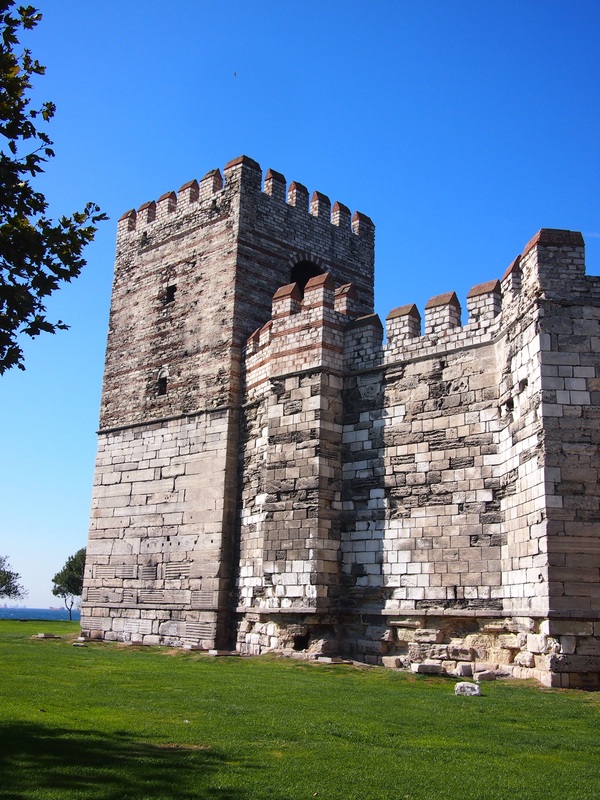 We started out from the Sea of Marmara coast at the Marble Tower, so called because its lower half is faced in marble. 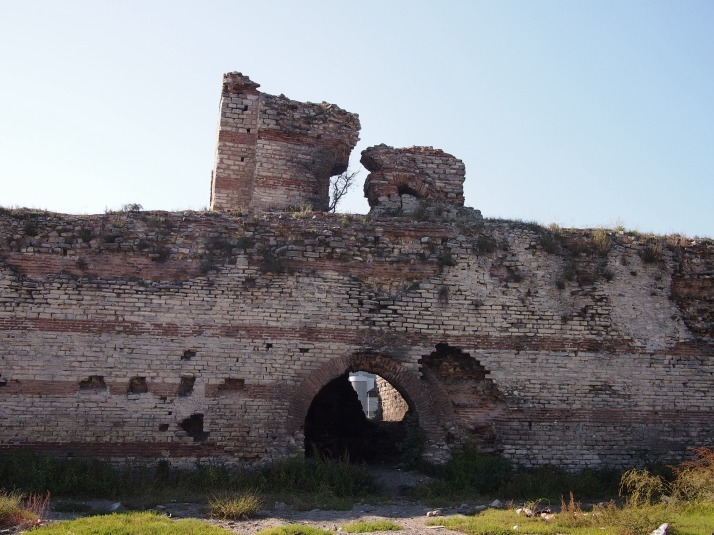 This structure was the joining point between the sea and land walls although nowadays it is disconnected from both by a busy road. We had a scramble behind the tower and poked about in the remains of its rooms, now being used by some of the city’s homeless for shelter. 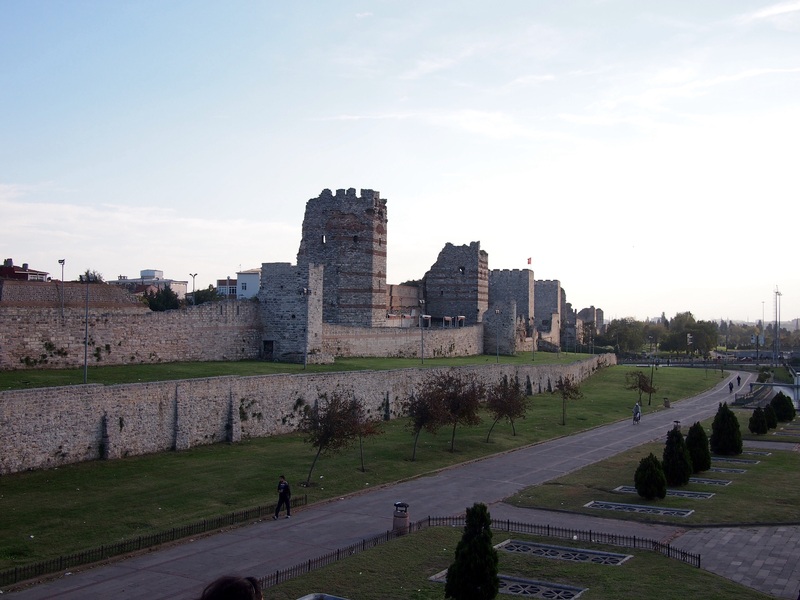 After about 400m walk alongside the wall we came to Yedikule, literally ‘Seven Towers’, a castle within, and a part of, the walls. After the Conquest, the Ottomans built three additional towers and an enclosing wall inside one of the gates of the land wall. 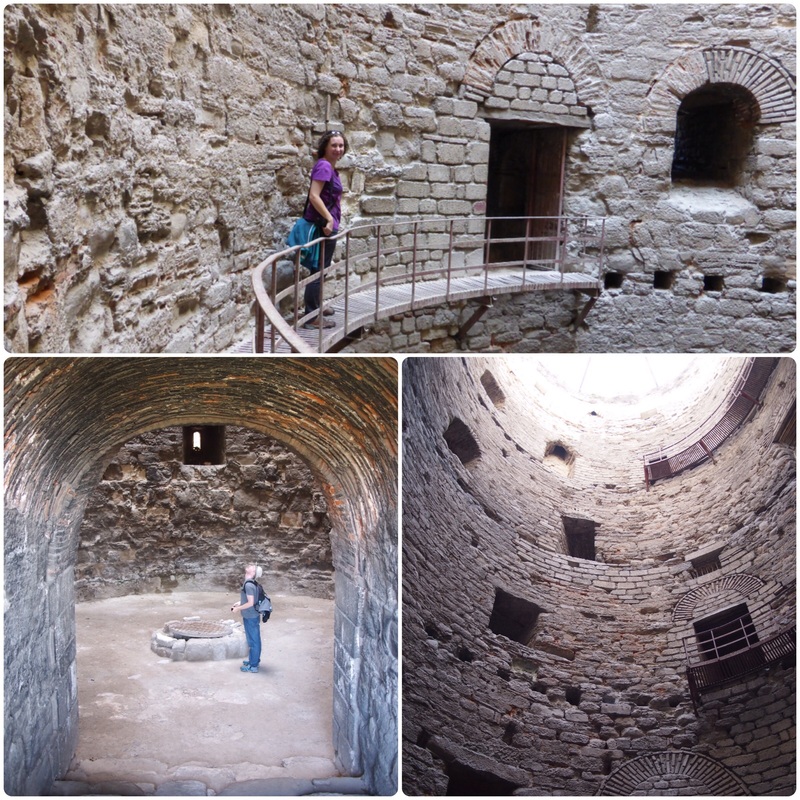 The castle was not used for military purposes but partly as a prison and partly as storage for the State Treasury. The tumbledown minaret of a small mosque still stands in the centre of the courtyard. We were able to climb inside some of Yedikule’s towers as well as around its wall, admiring the sturdy construction and getting good views out to the sea and over the city. 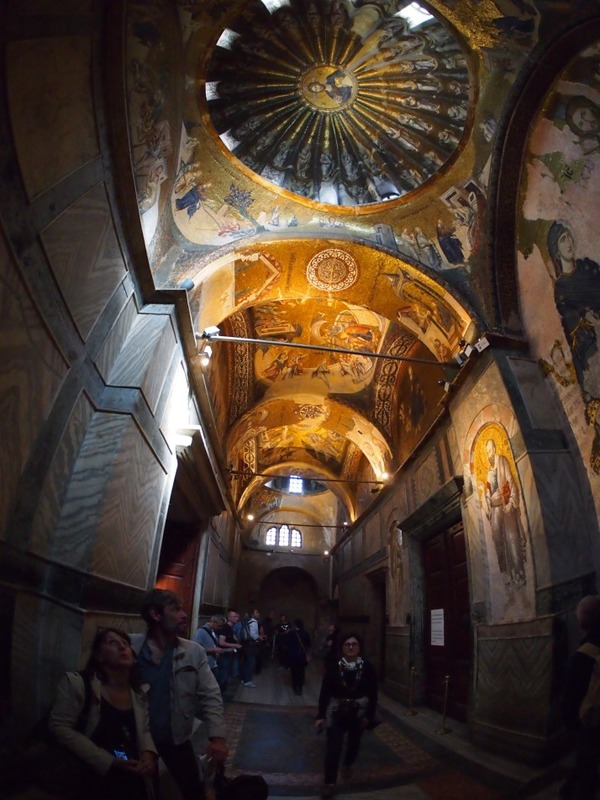 We even spotted some of the city’s landmark buildings – Haghia Sophia, the Blue Mosque and the Süleymaniye Mosque. 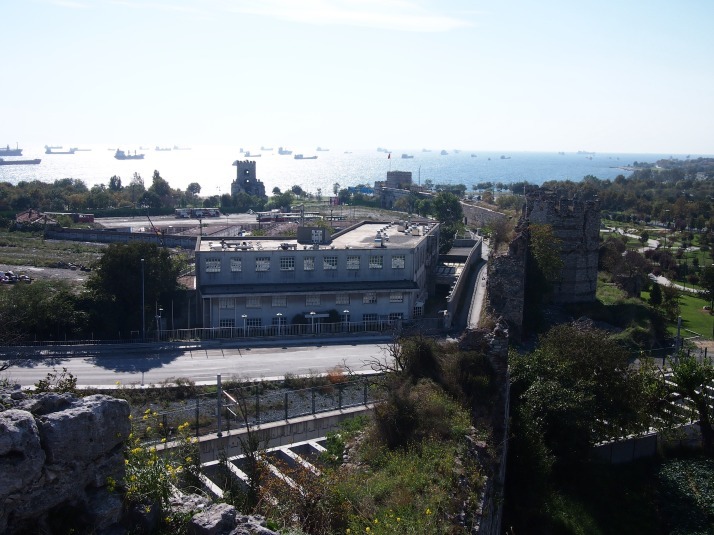 Looking from the top of the walls of Yedikule along the land walls to the Sea of Marmara. The Marble Tower can be seen beside the sea in the centre left of the photo. Moving on we found that although some sections of the wall have been restored so that you can walk along them, much of it is crumbling and even if it is possible to walk along the top there are not good ways to get up and down so for the most part we were following small streets as close to the wall as we could get. Originally and for centuries afterward there were just ten gates in the whole length of the wall and only five of those crossed the moat allowing access to the outside world. However, in the last hundred or so years sections of the wall have been knocked down to allow the passage of the railway line and several large highways. 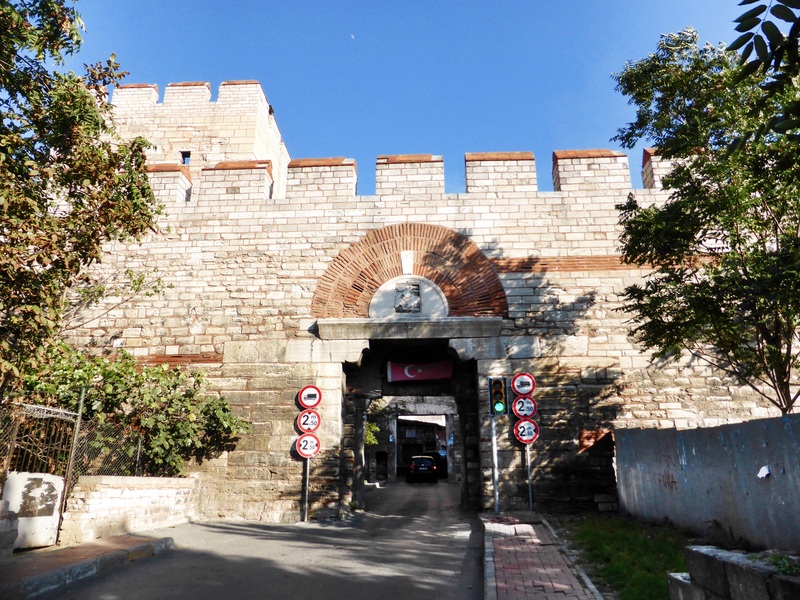 Even so, the old gates are still in use and given their width (only a little larger than one van or minibus) they must cause bottlenecks of traffic between what is now the city without the walls and the old town. Towards the Golden Horn end of the walls is Tekfur Saray, originally a Byzantine palace but since the end of the 14th century it has had rather a chequered history serving time as a brothel, a pottery and a menagerie for larger kinds of exotic animals amongst other things all the while somehow maintaing its original character. Unfortunately it isn’t open to the public at the moment although it looks like it’s under restoration so perhaps soon it will be. By the time we reached this point of the walk it was late in the afternoon. Walking the streets through the nearby neighbourhood on the descent to the Golden Horn we were amused to see housewives doing their shopping by lowering down baskets from their apartment windows to the stallholders below, presumably with a list and payment inside. 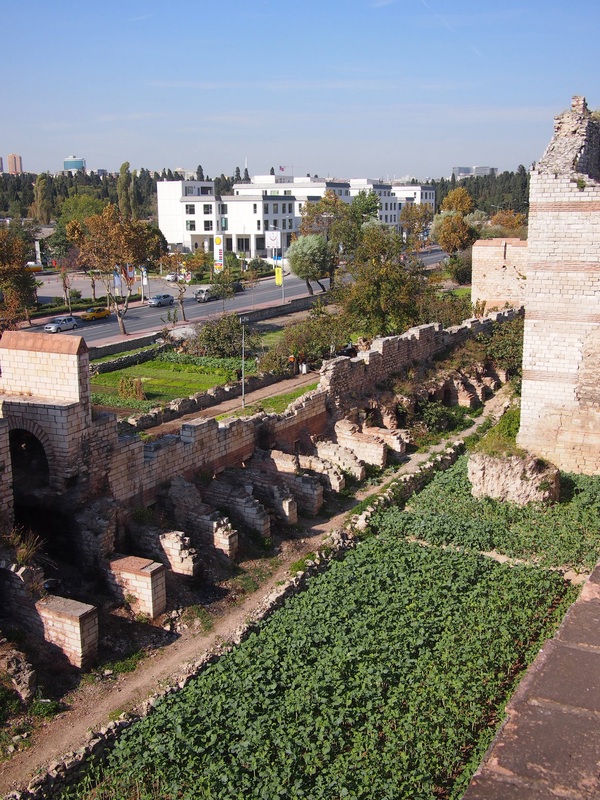 Close to the Golden Horn end of the land walls is the former Church of St Saviour in Chora, known in Turkish as Kariye Muzesi. 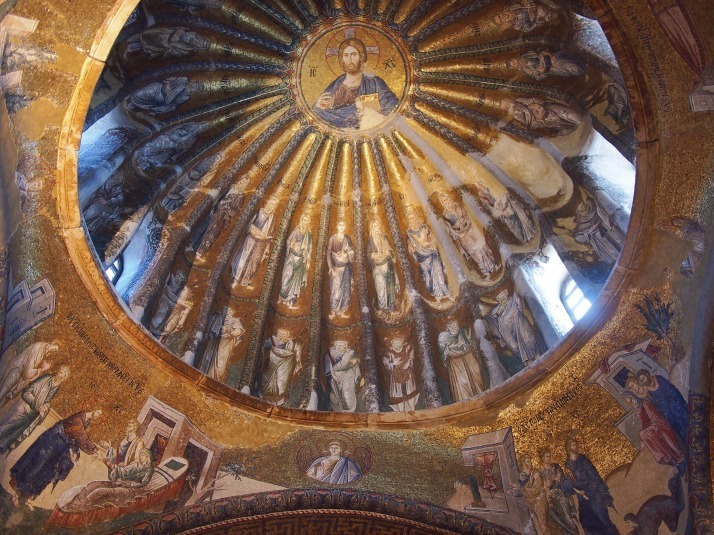 Like many of the Byzantine churches that we’ve visited in Istanbul, this one was converted into a mosque after the Ottoman Conquest. 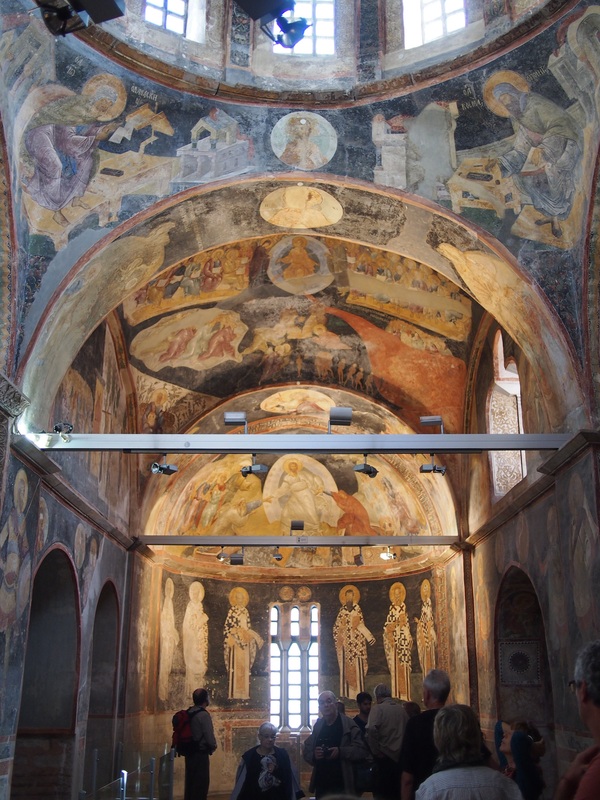 Fortunately its magnificent mosaics and frescoes were preserved, even if unconsciously, by being covered in plaster and in the 1950s they were restored and the building opened as a museum. Further restoration has begun recently and the nave of the church was closed off for this work during our visit. A church or monastery has stood on this spot since before the land walls were built. It underwent several remodellings from the 11th century onwards culminating in the rebuilding and redecoration which gave the church its current form in the early 14th century. The man responsible for this was Theodore Metochites, a high ranking official in the court. 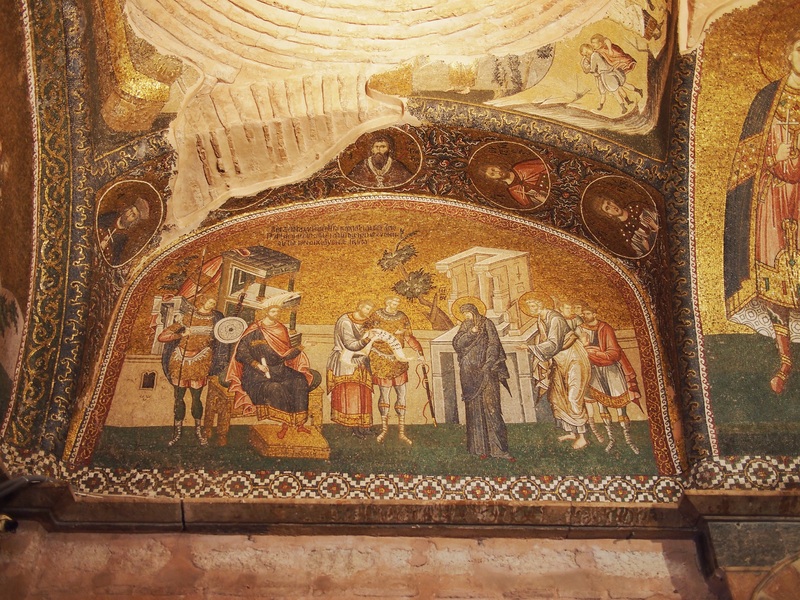 The mosaics form a series of groups including the life of the Virgin Mary, the life of Christ and Christ’s ministry. The Strolling Through Istanbul book highlighted them for us in order which greatly enhanced the experience as we were able to follow the stories being told. 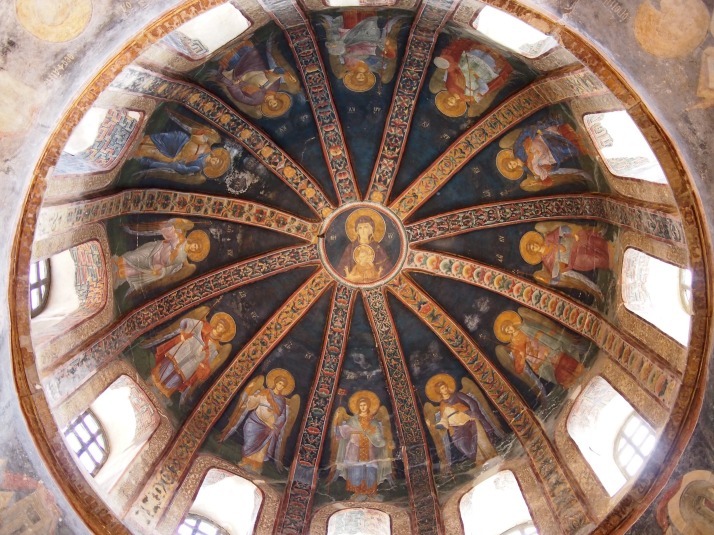 In the south-east corner of the church is the Paracclesion, a type of side chapel. 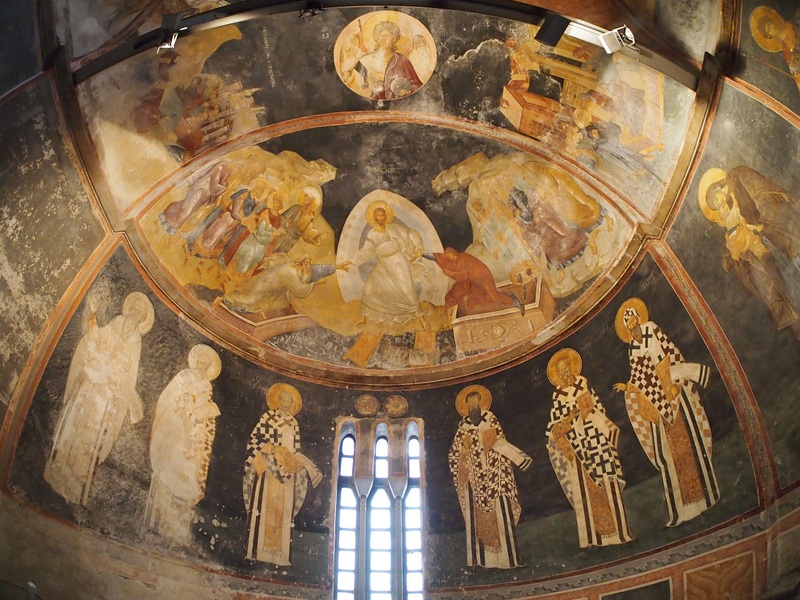 Here, rather than mosaics, the walls and ceiling are covered with frescoes showing various aspects of the passing over from life to death, along with portraits of Orthodox saints. 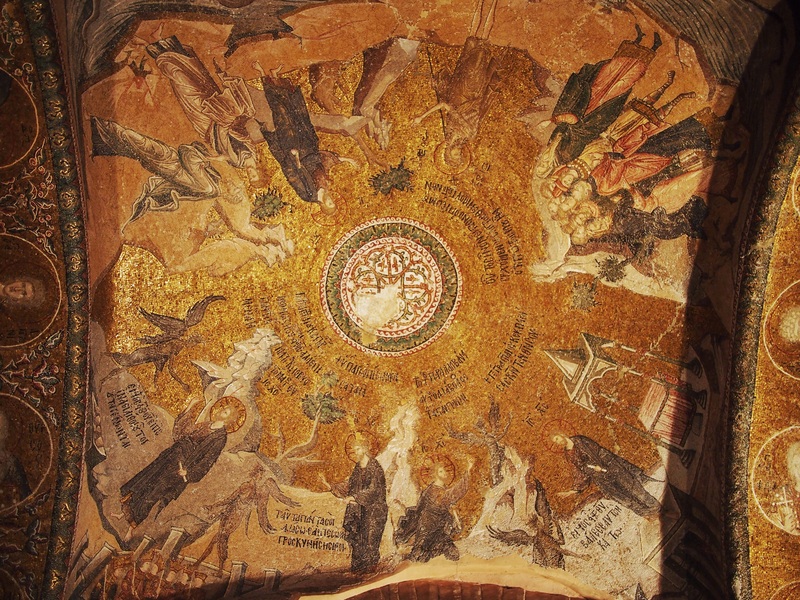 Remarkably it is thought that the same artist responsible for the mosaics also did the frescoes. While undoubtedly masterly these were for us much less spectacular than the wonderful gilded mosaics. The church was busy but as everything you want to see is at a height and requires looking up other people don’t get in the way so much. 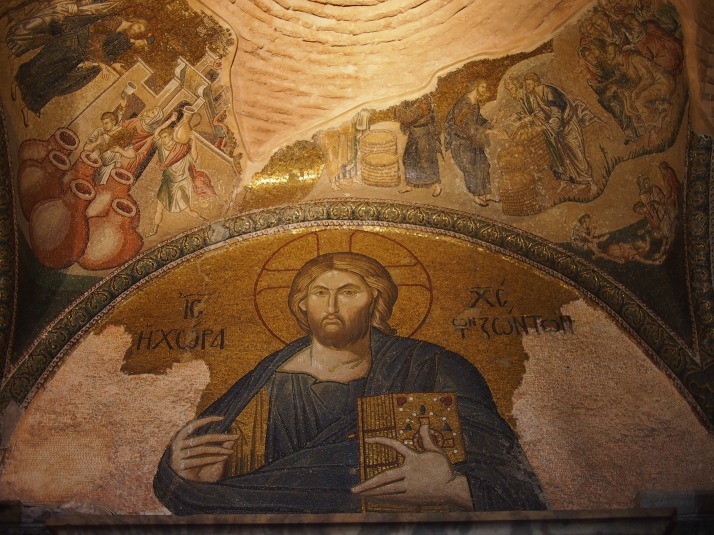 For us this was definitely a highlight of our stay and I would say a must see sight for anyone visiting Istanbul. 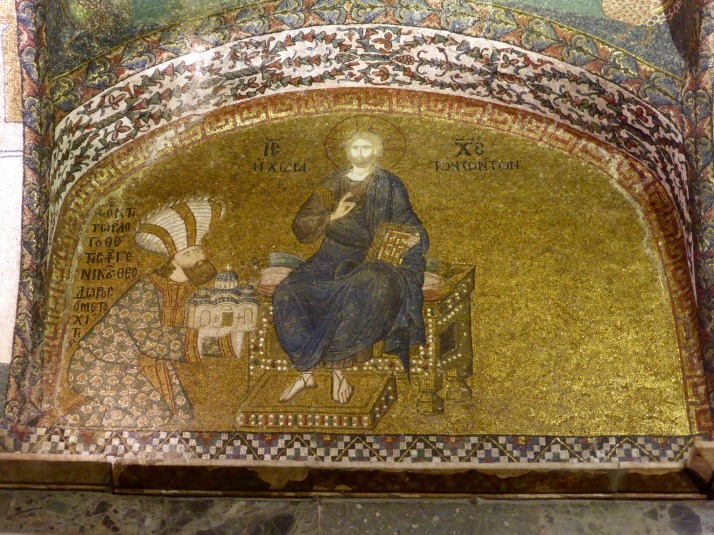 This entry was posted in Places and tagged Church, Istanbul, Museum, Strolling, Turkey on November 10, 2014 by Julie.